ALMA's giant white antennas are made of steel and carbon fiber reinforced plastic, enabling them to be strong, yet light enough not to deform under their own weight. SAN PEDRO DE ATACAMA, Chile — High up in the Chilean desert, on a plateau so dry and red it looks like it could be Mars, dozens of giant telescope antennas stare at the sky in unison. 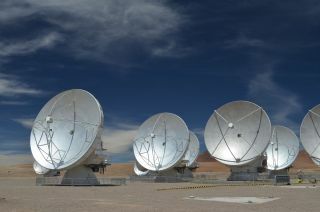 They are ALMA radio telescope — the Atacama Large Millimeter/submillimeter Array — and together they can see deeper and farther in long-wavelength millimeter light than any instrument before. The $1.3 billion observatory, the product of 30 years of planning and 10 years of construction, is already sighting new planets in the process of forming around stars, and some of the most distant, ancient galaxies known. To celebrate the inauguration of ALMA, officials and scientists gathered today (March 13) here at the observatory's Operations Support Facility, base camp for the telescope, which, at 5,000 meters (16,400 feet), is so high that scientists must breathe supplemental oxygen to work there. "We are very proud to inaugurate this great project in which so many people have worked so hard for so long," said the president of Chile, Sebastian Pinera, who visited ALMA for the occasion. "ALMA will allow us to get deeper into the universe, but also into our own nature and our own lives." Earlier, astronauts Tom Marshburn of NASA and Chris Hadfield of the Canadian Space Agency called into the ceremony from the International Space Station to wish the ALMA project good luck. "Enjoy your new discoveries!" Hadfield told the scientists. ALMA, a new radio telescope array, is built high up in the Chilean Atacama desert, at an altitude of 16,400 feet (5,000 meters). ALMA is an array of 66 radio dishes — most 40 feet (12 meters) in diameter — that work together to create images as detailed as if they were made by a single telescope 10 miles (16 kilometers) wide. "At the end we will have a telescope that has an angular resolution better than the Hubble Space Telescope, but now at millimeter/submillimeter wavelengths," said ALMA's director, Thijs de Graauw. By observing in this wavelength range of light, ALMA can probe cosmic phenomena that are invisible in optical light because they are shrouded in gas and dust. Dust particles in space absorb visual light and re-emit it in the millimeter and submillimeter range, so ALMA can see into, for example, the clouds of gas and dust where new stars are born, and the disks of debris that enshroud stars, from which planets are formed. "ALMA will really unravel the physics of how stars are born and how they die," said Ewine van Dishoeck, an astronomer at Leiden Observatory in the Netherlands who is a member of the ALMA board. "ALMA will see planet formation in action, and it sees it at the locations also where terrestrial planets are made." The project is a collaboration between North America, Europe and East Asia, with the cooperation of Chile. The three contributing regions each built about a third of ALMA's antennas, and split the other work as well. Scientists from the three partner regions will be awarded most of the telescope's observing time, with 10 percent being reserved for Chilean astronomers. By working together on ALMA, the partner nations got a facility much more powerful than any they could have built singly, researchers say. And its spot here in the Atacama Desert is ideal for astronomy, because the skies are exceptionally clear and dry, and the high altitude puts the telescope above much of the moisture of Earth's atmosphere, which blurs light. "It's so far beyond any [existing] capability in the millimeter domain," said astronomer Ethan Schreier, president of Associated Universities Inc., which oversaw North America's contribution to ALMA. "There's nothing that will compete with this for a very long time. When you introduce a totally new capability, you always discover new things that you don't predict." The antennas of the Atacama Large Millimeter/submillimeter Array (ALMA) shine under the southern sky. Image released Dec. 31, 2012. ALMA has 57 dishes working now, with all 66 expected to be delivered this summer. Each is a giant white behemoth made of steel and carbon-fiber-reinforced plastic, enabling it to be strong, yet light enough not to deform under its own weight. "The antennas are particularly high tech," said Al Wootten, ALMA program scientist for North America. "The surface accuracy is better than 25 microns — that’s the size of a human hair across the whole 12 meters of the antenna." To combine the data collected by all 66 dishes, a cutting-edge supercomputer capable of 17 quadrillion calculations per second had to be built — and installed in a facility scientists say is the second-highest building on Earth (after a train station in Tibet). Ultimately, pulling off such an ambitious, challenging project is cause for celebration, astronomers said. "It's very emotional indeed," incoming ALMA director Pierre Cox told SPACE.com. "The last time I was here was 2001 and there was nothing here. When I came back in December I looked at the plateau and I saw more than 50 antennas, and it was a really a great shock." Clara Moskowitz is visiting Chile for the ALMA inauguration on a trip paid for by the U.S. National Radio Astronomy Observatory.